Elementary school is a school for students at their first school years, before they enter secondary education. The exact ages vary by country. 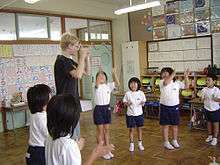 Elementary school is usually part of the compulsory education, especially in the Western countries.